Enter, the recently disgraced financial journalist, Mikael Blomkvist, who has just been convicted of libeling a heavy weight financier, Hans-Erik Wennerström, and faces a hefty sum and three months in the slammers at Rullåker. His rapidly deteriorating career begins to turn around when he is approached by the the prominent industrialist Henrik of Vanger Industries as one last resort to unravel the mystery surrounding his great niece’s, Harriet Vanger, disappearance over forty years ago. In return, Vanger will provide Blomkvist with damaging information against Wennerström. Blomkvist agrees, albeit reluctantly and skeptically. For one year he’ll be on Hedby Island while he goes about the business of the investigation, and scrutinizing the alibis of those of the Vanger clan that were on the island on the day Harriet had gone missing, as Henrik is convinced that one or more amongst his family is responsible. Blomkvist goes under the cover story of ghost writing the Vanger family chronicle. He’s aided by the title character Lisbeth Salander, the girl with the dragon tattoo. Salander is a social ward of the state, she’s antisocial, has no urge what so ever to submit willingly to authority and is covered with an assortment of tattoos along with piercings to complete the gothic ensemble. She also happens to be a genius hacker who prefers to dish out her own brand of justice and revenge upon those vile and ruthless users and abusers that crawl on the face of the earth, whom she despises with a passion to be reckoned with. Together they delve into the depths of the Vanger family’s past until they find themselves very close to cracking this mystery open when someone begins to threaten them to get lost and keep away. Despite the looming danger, they proceed to finally discover the events that lead to Harriet Vanger’s disappearance and possibly her death. When I’d first picked up The Girl With The Dragon Tattoo I didn’t know what really to expect, I mean I’ve read the blurb but the genre of crime fiction is relatively new to me. In the beginning, where it was elaborated how Blomkvist had landed himself in this spot was confusing to me mainly because of all of this financial mumbo-jumbo, so most likely readers savvy in this field are more comfortable here but I believe I got the gist of the situation after reading certain parts till my head hurt and finally putting in down for a short while before resuming. The characters, on the most part, are believable and were three dimensional. Now I’ll zoom in a bit on Lisbeth Salander. Lisbeth is a truly intriguing personality; she’s distant and wants little to do with anyone else unless she really has to. Her general behaviour and intense dislike to abusers leads me to believe that she had suffered at the hands of one herself in her past. She won’t take nonsense lying down and her survivor’s spirit is one of the reasons why I admire her. There is something … something I can almost place my finger upon what that makes me so eager to learn more about her. We learn of certain family members’ involvement with the Nazis during the Second WW and a little about Henrik Vanger’s stay in war time Germany. I thought this particularly interesting because I’m partial to even fictional accounts during that time in history. I found this book surprisingly violent, with certain parts that had thrown me a little off balance but I had the feeling I’d better get used to it. I should have taken a hint to the snippets of statistics of abuse of women in Sweden, because it’s of the themes later identified. The fact that I had to put down and pick it up again numerous times before I got around page 270 to really get hooked, is the reason why I gave this book 4 stars. I know that lots of books start off by stretching and yawning before they finally pick up substantial speed but for me 200 and something pages is too much. 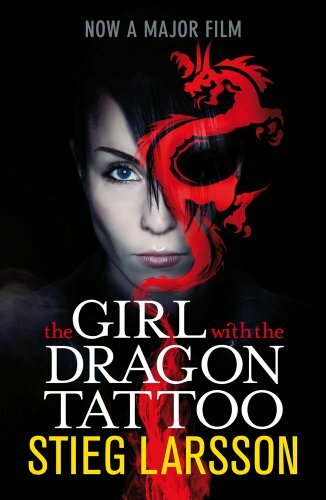 With that being said, overall The Girl with The Dragon Tattoo is a book truly worth reading and frankly if someone had told me it happened in reality I would stare in utter fascination and, at the same time, horror but nevertheless I would eventually believe him because the plot is believable. Who knows what dark secrets those huge empires quietly sweep under the carpet? How many women had suffered such unimaginably gruesome torture, with their screams that go unheard? This just makes me wonder. Welcome! It’s great to have you here! A lovely first review! This book has been sitting on my bookshelf for a long while. I have yet to pick it up. However, I did watch the Swedish adaptation. It was very good. Violent but good. Thanks, I’m glad to be here! You should give it a go when you can. I haven’t seen either versions as yet but I hear that the Swedish one is more popular, though I can definitely see Daniel Craig as Mikel Blomkvist. It is rather violent, and I think it would pale in comparison to what goes on in reality. Very interesting review. I’m really surprised you gave this book 4 stars. Having seen the film, I was just horrified by the sexual violence and didn’t care at all about the rest of the story. I guess you’re much stronger than I am. I’d be lying to you if I said that those parts didn’t affect me, they certainly had. It made my skin crawl and I wanted to stab the pages while screaming “Die! Die! Die!”. Before, I was caught up in the research on Vanger mystery so when Lisbeth was assaulted I was thrown aback and even more so when what Harriet had suffered though came to light, but I stopped for a moment and let it sink in. I tried to let it not bother me. At first I, too, thought that it can’t get worse than Harriet’s case but the fact that it happens in real life bugs me out immensely. When I had said “ … pale in comparison to what goes on in reality” I meant that I believe that things can indeed get worse – even though it’s hard to believe – because I’ve now gotten used to this idea that as man (mankind the whole) is capable of immense joy he’s also capable of unspeakable horror, so I try to avoid underestimating ‘him’. As for me giving it a 4 star rating, it might or might not make sense to you, I found the Vangers and the mystery of Harriet interesting as I had Salander, and for the very reason that Larsson didn’t spare us from the grim reality of what might be happening to women out there right now, at this very moment. I know things of this sort has been happening but this … this … what happened to those women in the book, I couldn’t have even began to imagine. Believe me, it doesn’t make me feel any safer but I’d prefer to know what sick monsters are walking amongst us. I don’t think I should minus a star because he pointed out a truth that there are men that hate women to such an extreme extent. I’m yet to see either versions of the movie, it’s gotten mixed reviews and I’m not sure I want to see it anymore. Reading The Girl with the Dragon Tattoo is one thing, with all the images one can come up with, watching it is totally something else when it’s being played out before your eyes. So that’s my take, but I understand how disturbed you must feel, it wasn’t something I could run away from experiencing myself. Buddhists would say “water the seeds of happiness, not those of sadness”. I really like your blog. I’ve tried talking about it with a couple of friends but none of them read it before so I couldn’t go too much. The Buddhists are wise people 🙂 I just contribute to this blog occasionally, Kirsty, momfog, Carrie Slagger and J Mcartee started this blog and I fell in love with it so I asked to join. Pingback: The Girl With The Dragon Tattoo, by Stieg Larsson « Booking It Up!